Hi. My name is Sage. I watch a few cooking shows like Master Chef Junior and Chopped. Two of my favorite chefs (besides my mom) are Chef Rich Landau of Vedge Restaurant in Philadelphia and Chef Chloe Coscarelli. I go through my Mom’s vegan cookbooks and mark a post-it on all of the recipes I want her to make. I really love animals. I visited Farm Sanctuary for my birthday this past year and loved it. I want to be a vegan mostly because I really love animals so much and I want them to be my friends not my food. 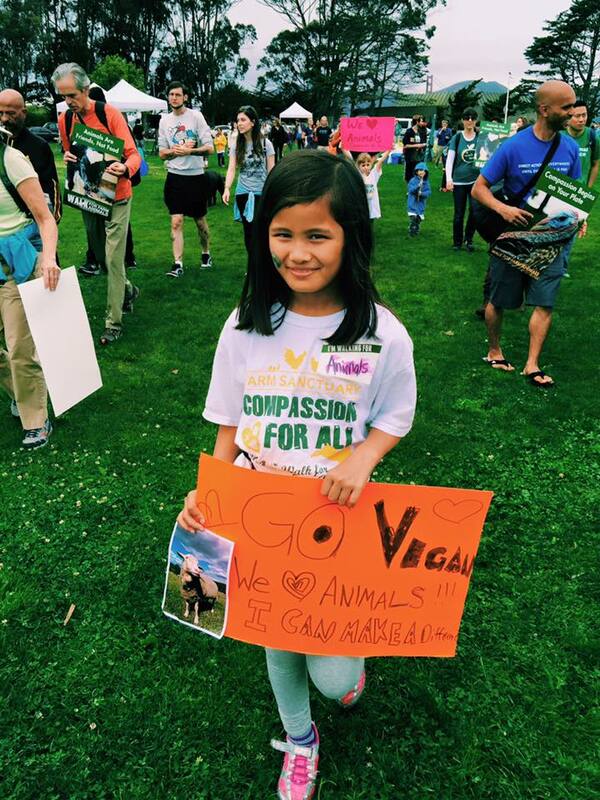 Here’s an article I wrote about being vegan as a kid! Some dishes I really like from my Mom’s blog are her Lentil, Kale and Sweet Potato Soup, her Chocolate Banana Zucchini Bread, and her Roasted Root Jewels. In The Sage Vegan you will find recipes that kids can make that are also very delicious. I make up a name for the dish, suggest some ingredients and then my Mom and I work together to design the final recipe. And then we cook it together! I hope you love The Sage Vegan! Thank you so very much! I’m glad you stopped by OHT. Please visit often! Wish there was more adults let alone children like her. Thank you for this sweet comment. I think she’s pretty awesome too. : ) Thank you for showing your support of Sage and her passion for animals with this comment! We are looking for vegan kids to tell their story on the radio. Please email us to discuss scheduling an interview. You are one smart cookie! I’m always really happy to see someone your age really thinking about what they are eating and where it comes from! Just think how many lives you have save already! !